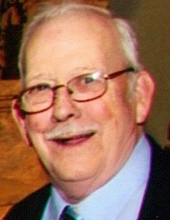 James William Cooke, 86 of Lodi, Ohio passed away Saturday, February 2, 2019 at Hospice of Medina County following a period of declining health. He was born September 2, 1932 in Cleveland to James B. and Mae (Glover) Cooke. Jim served with the U.S. Navy from 1949 to 1953. He had resided in Brunswick before moving to Lodi 30 years ago. He was employed as a pressman at RPM in Brunswick and later worked at Miller Brothers Grocery in Lodi, and Lodi Community Hospital. He was active in, and dearly loved his Lodi community. He was preceded in death by his wife Joan in 1997. Visitation will be Tuesday, Feb. 5, from 1:00 – 3:00 and 6:00 – 8:00 PM at Parker Funeral Home, 210 Medina St., Lodi (330-948-1122), where the funeral service will be held immediately following the visitation, beginning at 8:00 PM. Chaplain Don Bolich will officiate. Private interment will be at Eastlawn Memory Gardens in Brunswick. Memorial contributions may be made to Hospice of Medina County, 5075 Windfall Rd., Medina, OH 44256. "Email Address" would like to share the life celebration of James W. Cooke. Click on the "link" to go to share a favorite memory or leave a condolence message for the family.